Anway, the first was an early birthday present from one of my dearest blogging friends. When Blair asked me if I would mind one of her quilted bags instead of the tea cosy that we had been talking about, I about spewed my cup of coffe on the computer screen. Did she even have to ask?? I told her I wanted to be surprised and that she could do the picking for me as far as colors and fabrics (I love a little surprise now and then), and man, did she pick the perfect bag for me! 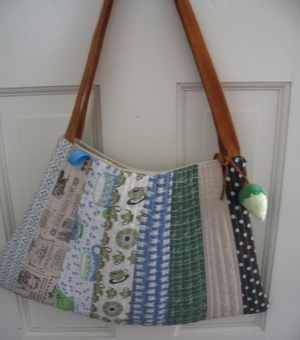 I love every yummy slice of fabric on this bag–from the green cursive alphabet to the tea cups and saucer fabric, to the vintage prints and polka dots. Its wonderful and so exciting to actually have a true blair bag in my posession. And the small details hidden inside make it so unique and special, too. 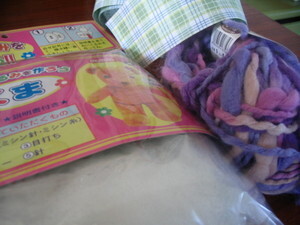 And to top it off, she sent along some other goodies from the daiso store near her house, including the cutest little "roly-polies"– as we call them in our home– wooden toys for the girls…Thank you Blair. Really– a big thank you. 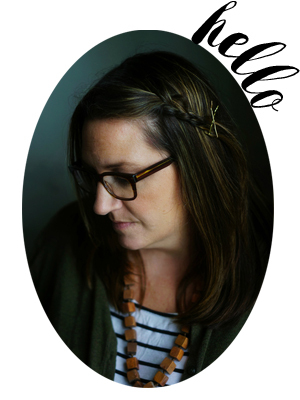 Awhile back, I came across alicia’s wonderful blog after scrolling through the tie one on smock entries. Her simple little linen smock was one of my favorites and when I commented on how much I loved it she offered to make me my very own in exchange for one of my pendants. I obviously got the better end of the deal, in my opinion. 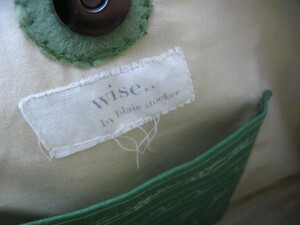 The smock is wonderful! Fits perfectly, even though I’m not wearing it in the picture–I’m too hot, sticky and nasty to pose for a photo right now. I absolutely love it and can’t wait to wear it with a little tee and a pair of jeans. Thank you so much alicia!! 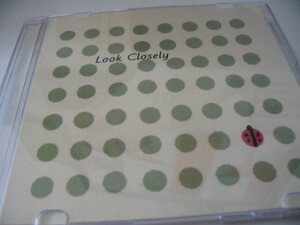 And last but certainly not least– this wonderful CD came from Courtney at two straight lines. When I saw the list of songs she put together for her kid’s music swap CD, I knew we must be something like musical soulmates…so she offered to send me a copy. And we love it. Just today, I put it on again in the car and Emma said, "mom, you really like this CD don’t you?" That says it all. If I didn’t have a crafty/family blog, I’d probably have a music blog. I love music and even more than that, I love discovering new music. So this one is a big score for me. Thank you so much Courtney. Once I get my act together, I’m going to send you a CD in return. I think you’ll enjoy it. i am a post or two behind but the stitched birds are just beautiful, im about to do some stiching on calico to replace a door on a cupboard…inspiring. the pattern for the overall is one of those old 50s patterns i picked up from an op shop, those old patterns are so easy. What great mail! 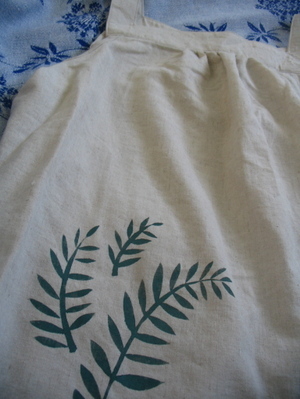 Your little smock and bag will look great together! Wow, so many lovely birthday pressies. Lucky you! Waouw ! Lucky you !! All these great mails !! I hope you’re fine ?! I wish you a swwet day ! Smooches !! Gorgeous bag, beautiful smock, deserving Mother! Early birthday? I hope when it comes its a fun one- you are off to a good start! Your very own Blair bag, now that is a famous piece of handy-work! So lovely. Hey, I replied to one of your comments on my blog and it came back to me??? Have you had any email troubles? xo. 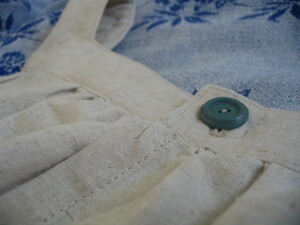 I am just so glad the smock fits, and I hope you’ll enjoy it! And you didn’t get the better end of the deal, silly. I LOVE my necklace!